See the historic city of Istanbul on a day-trip from Kemer that includes a guided tour of the city’s highlights, round-trip flights, and all airport transfers. Follow in the footsteps of the Ottoman Sultans at Topkapi Palace, explore the old city center, and browse for souvenirs at the Egyptian Bazaar, with the option to add a sightseeing cruise on the Bosphorus Strait. This full-day tour is a convenient, cost-effective way to include Istanbul on a trip to Turkey’s Mediterranean coast. Start with 5am pickup at your hotel in Kemer, then travel to the airport to catch a 1 hour, 15-minute flight to Ataturk International Airport, where a tour guide will meet you upon arrival. The first stop in Istanbul is Topkapi Palace, a sprawling complex that was once the home of Ottoman sultans, courtesans, and harems. Take in exhibits of Ottoman jewelry, Islamic relics, and traditional clothing, and find views across the Bosphorus Strait from the manicured grounds. After your time at Topkapi Palace tour, you’ll have one hour to purchase lunch from a nearby restaurant or café, then continue into the oldest part of Istanbul. See Hippodrome Square, the site of ancient sporting events, and tour the Blue Mosque, a dramatic landmark named for the thousands of Iznik tiles that line the interior. Brush up your bargaining skills at the Egyptian Bazaar, where you can shop for unique souvenirs, spices, handicrafts and more. 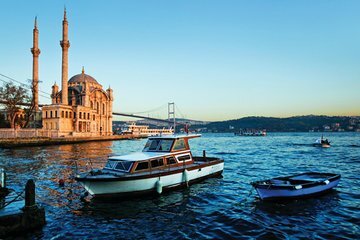 After the Egyptian Bazaar, you’ll have the option to see Istanbul from the water on a sightseeing cruise down the Bosphorus, and stop by a local restaurant for dinner (the cruise and meal are not included in the tour price). The driver will return you to the Ataturk International Airport at roughly 8pm to catch a flight to Kemer. Upon arrival, another driver will meet you at the airport and return you to your original departure point.